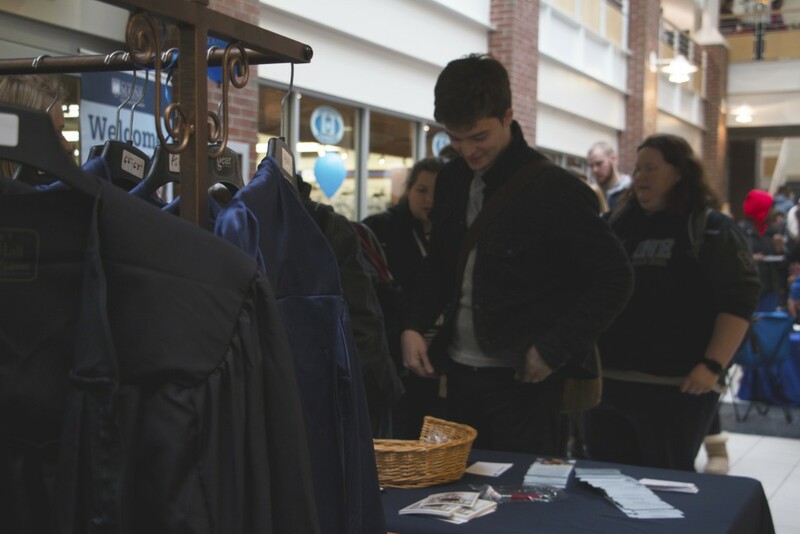 New Media senior William Mcenry orders his cap and gown at the 2016 University of Maine Grad Fair in order to walk in the graduation ceremony in May. Photo by Zach Davis, contributor. Graduating University of Maine students gathered Thursday in the Memorial Union for the annual Grad Fair. Most students were there to pick up their cap and gown as well as graduation tickets but the University, along with independent vendors, were offering class rings, graduation announcements and graduation photos. In addition to the graduation trappings, the university offered graduate school information and advice from the Career Center. Despite the throngs of students consistently filling the Union throughout the day, the Grad Fair ran smoothly. Upbeat music from above created a positive atmosphere in the busy space. “I appreciated the cupcakes while waiting in line and the music was straight fire,” Josh Rosa, a graduating biology student, added. While the event was suffused with excitement over the upcoming graduation, the reality of the situation wasn’t lost on the seniors. “I’m excited to graduate, sad to say bye to the people of UMaine and scared of not having a plan for next year,” Rosa said. As graduation closes in, students consider their future and look ahead. Nervous excitement colors the Grad Fair, but not every student is so worried. Fourth-year English student Nathan Farnham is looking towards his future with a calmness surrounding uncertainty. Despite the pressures of an upcoming graduation, the enthusiasm wasn’t diminished. Christine Cloutier, a photographer with GradImages has traveled to dozens of schools photographing graduating seniors.